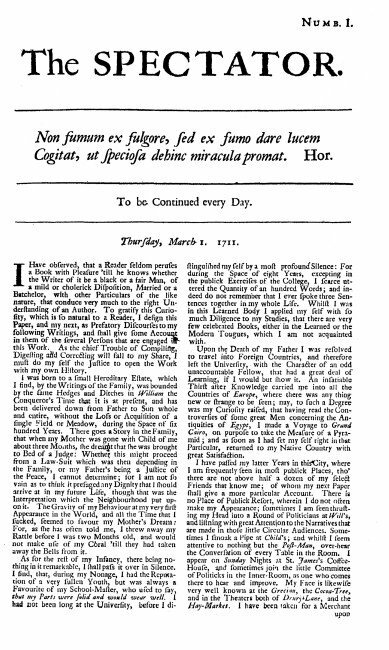 The first issue of The Spectator, 1711. Printed on both sides on a single sheet of paper, the series was then reprinted in bound volumes many times over the course of the next two hundred years. Cogitat, ut speciosa dehinc miracula promat.–Hor. I was born to a small Hereditary Estate, which according to the tradition of the village where it lies, was bounded by the same Hedges and Ditches in William the Conqueror’s Time that it is at present, and has been delivered down from Father to Son whole and entire, without the Loss or Acquisition of a single Field or Meadow, during the Space of six hundred Years. There runs a Story in the Family, that when my Mother was gone with Child of me about three Months, she dreamt that she was brought to Bed of a Judge. Whether this might proceed from a Law-suit which was then depending in the Family, or my Fathers being a Justice of the Peace, I cannot determine; for I am not so vain as to think it presaged any Dignity that I should arrive at in my future Life, though that was the Interpretation the Neighbourhood put upon it.. The Gravity of my Behaviour at my very first Appearance in the World, and all the Time that I sucked, seemed to favour my Mothers Dream: For, as she has often told me, I threw away my Rattle before I was two Months old, and would that was the Interpretation which the Neighbourhood put upon not make use of my Coral till they had taken away the Bells from it. As for the rest of my Infancy, there being nothing in it remarkable, I shall pass it over in Silence. I find that, during my Nonage, I had the reputation of a very sullen Youth, but was always a Favourite of my School-master, who used to say, that my parts were solid and would wear well. I had not been long at the University, before I distinguished myself by a most profound Silence: For, during the Space of eight Years, excepting in the publick Exercises of the College, I scarce uttered the Quantity of an hundred Words; and indeed do not remember that I ever spoke three Sentences together in my whole Life. Whilst I was in this Learned Body, I applied myself with so much Diligence to my Studies, that there are very few celebrated Books, either in the Learned or the Modern Tongues, which I am not acquainted with. Upon the Death of my Father I was resolved to travel into Foreign Countries, and therefore left the University, with the Character of an odd unaccountable Fellow, that had a great deal of Learning, if I would but show it. An insatiable Thirst after Knowledge carried me into all the Countries of Europe, in which there was any thing new or strange to be seen; nay, to such a Degree was my curiosity raised, that having read the controversies of some great Men concerning the Antiquities of Egypt, I made a Voyage to Grand Cairo, on purpose to take the Measure of a Pyramid; and, as soon as I had set my self right in that Particular, returned to my Native Country with great Satisfaction. I have passed my latter Years in this City, where I am frequently seen in most publick Places, tho there are not above half a dozen of my select Friends that know me; of whom my next Paper shall give a more particular Account. There is no place of general Resort wherein I do not often make my appearance; sometimes I am seen thrusting my Head into a Round of Politicians at Wills, and listening with great Attention to the Narratives that are made in those little Circular Audiences. Sometimes I smoak a Pipe at Childs; and, while I seem attentive to nothing but the Post-Man, over-hear the Conversation of every Table in the Room. I appear on Sunday nights at St. James’s Coffee House, and sometimes join the little Committee of Politicks in the Inner-Room, as one who comes there to hear and improve. My Face is likewise very well known at the Grecian, the Cocoa-Tree, and in the Theaters both of Drury Lane and the Hay-Market. I have been taken for a Merchant upon the Exchange for above these ten Years, and sometimes pass for a Jew in the Assembly of Stock-Jobbers at Jonathans. In short, where-ever I see a Cluster of People, I always mix with them, tho I never open my Lips but in my own Club. Thus I live in the World, rather as a Spectator of Mankind, than as one of the Species; by which means I have made my self a Speculative Statesman, Soldier, Merchant, and Artizan, without ever medling with any Practical Part in Life. I am very well versed in the Theory of an Husband, or a Father, and can discern the Errors in the Oeconomy, Business, and Diversion of others, better than those who are engaged in them; as Standers-by discover Blots, which are apt to escape those who are in the Game. I never espoused any Party with Violence, and am resolved to observe an exact Neutrality between the Whigs and Tories , unless I shall be forcd to declare myself by the Hostilities of either side. In short, I have acted in all the parts of my Life as a Looker-on, which is the Character I intend to preserve in this Paper. I have given the Reader just so much of my History and Character, as to let him see I am not altogether unqualified for the Business I have undertaken. As for other Particulars in my Life and Adventures, I shall insert them in following Papers, as I shall see occasion. In the mean time, when I consider how much I have seen, read, and heard, I begin to blame my own Taciturnity; and since I have neither Time nor Inclination to communicate the Fulness of my Heart in Speech, I am resolved to do it in Writing; and to Print my self out, if possible, before I Die. I have been often told by my Friends that it is Pity so many useful Discoveries which I have made, should be in the possession of a Silent Man. For this Reason therefore, I shall publish a Sheet full of Thoughts every Morning, for the Benefit of my Contemporaries; and if I can any way contribute to the Diversion or Improvement of the Country in which I live, I shall leave it, when I am summoned out of it, with the secret Satisfaction of thinking that I have not Lived in vain. There are three very material Points which I have not spoken to in this Paper, and which, for several important Reasons, I must keep to my self; at least for some Time: I mean, an Account of my Name, my Age, and my Lodgings. I must confess I would gratify my Reader in any thing that is reasonable; but as for these three Particulars, though I am sensible they might tend very much to the Embellishment of my Paper, I cannot yet come to a Resolution of communicating them to the Publick. They would indeed draw me out of that Obscurity which I have enjoyed for many Years, and expose me in Publick Places to several Salutes and Civilities, which have been always very disagreeable to me; for the greatest pain I can suffer, is the being talked to, and being stared at. It is for this Reason likewise, that I keep my Complexion and Dress, as very great Secrets; tho it is not impossible, but I may make Discoveries of both in the Progress of the Work I have undertaken. After having been thus particular upon my self; I shall in toMorrows Paper give an Account of those Gentlemen who are concerned with me in this Work. For, as I have before intimated, a Plan of it is laid and concerted (as all other Matters of Importance are) in a Club. However, as my Friends have engaged me to stand in the Front, those who have a mind to correspond with me, may direct their Letters To the Spectator, at Mr. Buckleys, in Little Britain. For I must further acquaint the Reader, that tho our Club meets only on Tuesdays and Thursdays, we have appointed a Committee to sit every Night, for the Inspection of all such Papers as may contribute to the Advancement of the Public Weal.